Justin Bieber joined an all star audience to watch the Los Angeles Lakers basketball team receive their championship rings and then go on to beat the Houston Rockets 112-110 at the Staples Centre last night. Justin and his new bff Jayden Smith sat courtside for the nail-biting game which went to the wire with the Lakers shooting a three point basket at the buzzer to win. 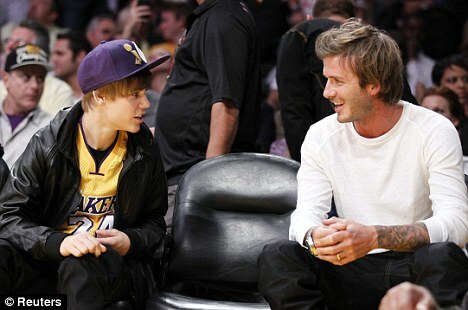 During the game Justin Bieber spent time chatting with football legend and LA Galaxy player David Beckham who has become a regular courtside at Lakers home games. Beckham looked happy and relaxed as he chatted with Bieber. Just the night before David Beckham and his wife Victoria had taken his three sons, Brooklyn, 11, Romeo, 8, and Cruz, 5, to see Justin in concert. JB and Jay Smith are like proper brothers look at em having a great time isn’t that so sweet bless them oh amd AAAAHHHHHHHHH LOVE YOU BOTH! YAY!! My to favorite things combined: the lakers and Justin Bieber! true lakers fan and true justin bieber fan! i don’t know where to look. is justin then david, justin then david..HAHAHAHA they are so hot!!! HAHA but.. i yeah.. i prefer justin. hi bieber. i’m from mongolia. mongolian girls love you………..
this is darn funny ! when me and my friend went to see justin on firday at arco arena (where the kings play) i saw a big office buliding that had a big banner for the kings and i ask my friend “hey you think there kings fans?” and she was all ” noooooooooo there Lakers tottaly ” and then we keep joking around everytime we saw somthing kings and i asked her later if she thinks justin pire thought it was kool to play were the kings played and she all no hes lakers .. and then he goes and sees the lakers thats so funny !